Many of you know the name, Mick Fleming. He served as CEO of the Association of Chamber of Commerce Executives (ACCE) for the last 16 years. During that time, Mick and his staff served the needs of 1,500 chambers of commerce and related organizations worldwide. Needless to say, he is a highly respected international leader among the chamber (and in many regards the economic development) community. Convergent Principals Andy Coe, Rick Kiernan, and Mark Bergethon with Mick at the 2015 ACCE Annual Conference. Who could have known that just a few short years later he’d be part of the team!? Created and led the Ford Foundation’s Regional Sustainable Development Fellowship. Served as a member of the US Chamber’s Committee of 100 and the Council of State Chambers for 15 years. Authored key works such as Making Your Chamber Make a Difference, Heresies Worth Discussing and the Horizon Initiative. We are excited to announce that Mick Fleming has officially joined our team as a partner! 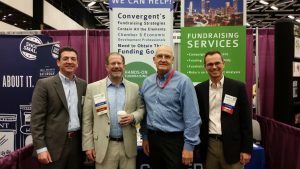 “Our entire team is proud and honored that Mick has chosen Convergent as a partner after leading ACCE. He shares our values of integrity and service to others that will resonate with the wide variety of nonprofit organizations we serve,” shared Andy Coe, on behalf of the Convergent Principals. Please join us in congratulating Mick on his new role as Partner. We can’t wait to see what the future holds for Convergent, our team, and our clients with him on-board.